Growing apple trees in Arizona can be somewhat challenging because there are many different climates within the one state. The lower desert areas are very hot in the summer, and warm to mild in winter, while the high desert regions have warm summers with cold winters. Apple trees need a minimum number of cool to cold hours each year or they will not blossom and set fruit. The number of cold hours varies from one type of apple tree to another, so species selection is an important part of growing them in Arizona. Dwarf apple trees can be spaced as close as 12 feet, but standard apple trees will need 25 feet of spacing, so also consider the size of the area you have to work with before selecting the apple tree varieties you'll grow. Select two or more apple tree varieties that are known to grow well in your area of Arizona. Most apple species must be cross pollinated, so two varieties are required for success. Selecting trees appropriate for your area is important because of the differences in climates. An apple tree such as the Granny Smith may do well in high desert areas like Flagstaff, but it might not get enough cold days in low desert sections of the state, such as Tucson or Phoenix. Select a planting site in your yard or garden. In Arizona, there are several factors that are critical for good site selection. The soil must be well drained and healthy, there must be at least six hours of sunlight each day, and the location must not be too close to buildings, overhead wires, or underground utilities. Arizona soil often contains caliche as well, which will cause problems with drainage and pH levels. If you don't have good tree growing soil on your property, you will need to create it first by adding the proper amendments and improvements. Dig a hole that is at least twice the size of your apple tree root ball, and as deep as the root ball is long. Make sure the sides of your hole are not smooth because this can cause the tree to become root bound. Soak your apple tree roots in a bucket of water to loosen them. Spread the tree roots gently in the bottom of the hole, making sure the tree is not placed any deeper than it was in its container. Put a few handfuls of the soil back into the hole, add water, and gently tamp it down to remove air pockets. Repeat this process until the hole is completely refilled. Spread 3 to 4 inches of bark, wood chips, hay or other organic material as a mulch around the base of the newly planted tree to help it conserve moisture and prevent the soil from becoming too hot during the day. Place protective covering around the trunk of the tree to prevent sunburn. White paint can be used for this purpose, as can loosely tied cloth or pieces of cardboard. Water the newly planted tree with at least 5 gallons of water each week for the first several months. Hotter areas of the state may require daily watering for the first month or two, then you can gradually back off to about 5 to 10 gallons of water per month once the tree has become established. 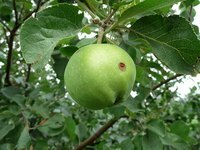 Give the apple tree extra nitrogen fertilizer starting the second spring after planting. Fertilization is needed just once each year in early spring. Either organic or commercial forms of nitrogen can be used. How Many Apple Trees Do I Plant Per Acre?